Answer some survey questions and we will forge the greatest strategy game to ever appear on PC. So far, with your help, we have imagined the perfect FPS (Rising Dark Shadow: Apocalypse Protocol!) and the perfect battle royale game (Final Battle Arena: Endgame Royale!) Now it's time for the noble RTS, a bastion of PC gaming, to get the same treatment. 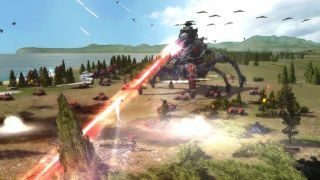 The RTS deserves a gorgeous modern blockbuster and we, the gathered millions of PC Gamer readers, are the team for the job. To do this we've created a quick and easy survey form with a few straightforward questions about the sort of RTS we should make. Questions cover possible names for the game, units, resources, battle length, and more. For some questions there's an 'other' option that lets you submit your own ideas if you don't see anything you like on the list. Once we have enough responses we'll write up the results in an article here on PCGamer.com, featuring pie charts and stats and lovely data. If we collectively manage to make something amazing I may even mock up a cover for the game, but only if the results are super freaking cool. Go nuts!